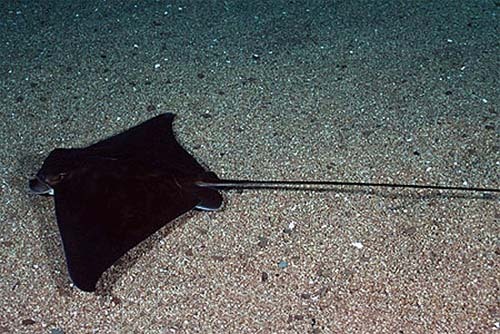 Although it is considered harmless to humans, this ray should be handled carefully because of the sharp spine at the base of its very long tail. It has a diamond-shaped pectoral disc that is much wider than long, with trailing pointed fins, usually a dark coppery to blackish on top and white underneath. This ray often schools in small groups in bays, shallow lagoons, and estuaries, stirring up crustaceans and mollusks that it crushes with its plated teeth. English language common names are common eagle ray, common bull ray, eagle ray, eagleray, mill skate, miller, sea eagle, spotted eagle ray, toadfish, and whipray. 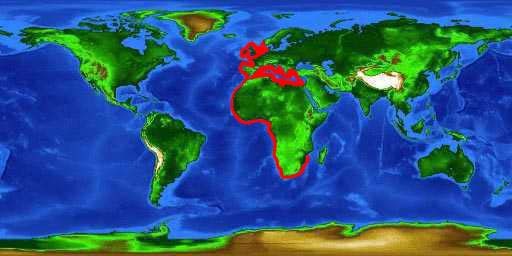 Other common names include acula (Italian), adelaarsrog (Dutch), adlerrochen (German), aetopsaro (Greek), aetós (Greek), aguila de mar (Spanish), aguila marina (Spanish), aigle commun (French), aigle de mer (French), aigle de mer commun (French), ajkla (Maltese), almindelig ørnerokke (Danish), aquila di mare (Italian), arendrog (Afrikaans), arendskoprog (Dutch), arnarskata (Icelandic), arreião (Portuguese), bon Jesús (Spanish), calumbe (Italian), cappuccinu (Italian), choucho (Spanish), chucho (Spanish), chuchu aquila (Dutch), chuco (Portuguese), ciuvette (Italian), colombo (Italian), denizkartali baligi (Turkish), diavuluni (Italian), dormideiro (Portuguese), duivelsrog (Dutch), eulenrochen (German), feraja (Italian), ferassa (Italian), ferraccia (Italian), ferrazo (French), ferri in coa (Italian), folya (Turkish), folya baligi (Turkish), fulya (Turkish), fulya baligi (Turkish), gallarón (Spanish), gewöhnlicher adlerrochen (German), gharabi (Arabic), ghasfur (Maltese), glorieuse (French), golub kosir (Croatian), hamiema (Maltese), hamiema komuni (Maltese), helidócna (Greek), hirondelle (French), jutjo (Spanish), kosir (Croatian), kotkarausku (Finnish), lagh’m (Arabic), lancette (French), matan (Italian), meeradler (German), milá (Spanish), milana (Catalan), mongeta (Spanish), monja (Spanish), monjeta (Spanish), mourine (French), mourine aigle (French), mourine noctule (French), mucchio caputo (Italian), mugghiu (Italian), muniacedde (Italian), nottola (Italian), obispo (Spanish), orinegliu (Italian), orlen a. skrzydlak pospolity (Polish), ornrocka (Swedish), peje águila (Spanish), pesce rato (French), pesce vacca (Italian), protene (Italian), protinu (Italian), pylstert (Afrikaans), raia (Portuguese), raia-beiço-de-boi (Portuguese), raia-morcego (Portuguese), raie aigle (French), ralapinuada (Spanish), ratão (Portuguese), ratâo-aguia (Portuguese), rato (Portuguese), ratón (Spanish), ratopennado (French), shqiponje deti (Albanian), taddarita (Italian), tajra (Maltese), tare (French), teraurchje (Italian), terre fauchée (French), tess (Arabic), tiss (Arabic), tistutu (Italian), tobiei (Japanese), totino (Spanish), vaccarella (Italian), viuda (Spanish), vultur de mare (Rumanian), and zaraurchie (Italian). The common eagle ray is considered to be of minor commercial importance and is taken by bottom trawls, trammel nets, purse seines, long lines, and hook-and-line. However it is sought as a game fish by recreational fishers who usually release the fish after capture. The flesh is highly esteemed and is marketed smoked and dry salted in the tropics where this species occurs. It is also utilized for fish meal and oil on foreign trailers. This ray is considered harmless to humans, however care must be taken when handling this ray due to the spine(s) located on the tail. > Check the status of the common eagle ray at the IUCN website. The common eagle ray is not listed as threatened or endangered by the World Conservation Union (IUCN) Red List as an endangered or threatened species. The IUCN is a global union of states, governmental agencies, and non-governmental organizations in a partnership that assesses the conservation status of species. The common eagle ray is distributed in the eastern Atlantic Ocean from Madeira, Morocco and the Canary Islands northward to the western coast of Ireland and the British Isles including the southwestern North Sea. 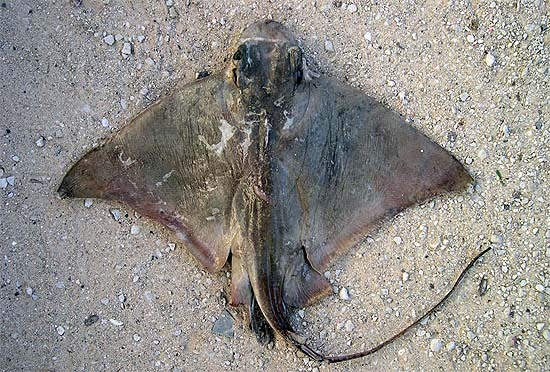 This ray is also found throughout the Mediterranean Sea but is absent in the Black Sea. A semipelagic species living at depths of 3-985 feet (1-300 m), the common eagle ray resides in tropical to warm temperate waters along coastlines in shallow lagoons, bays and estuaries. The common eagle ray often swims in groups close to soft bottom habitats. It is also occasionally observed offshore in oceanic waters. The disc of the common eagle ray is much wider than it is long and has broadly angular corners. The head is moderately short and has a bluntly rounded snout. The dorsal fin originates behind the tips of the pelvic fins. The pectoral fin rays continue forward under the eyes to form a subrostral lobe under the snout. The lobe is short and obtuse in the common eagle ray. The tail is distinct from the disc and is 2-2.5 times longer than the disc. It is slender and whiplike with one or rarely two spines on the top of the tail close to the body. The caudal fin is absent. 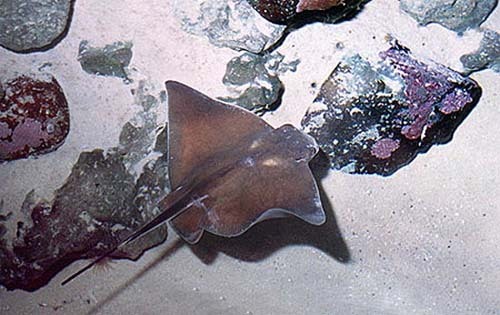 The dorsal surface of this ray is dusky bronze or blackish with olive to violet shading while the ventral surface is white with a brownish margin. The tail is blackish. The mouth of the common eagle ray is located on the underside of the animal. There are several papillae on the floor of the mouth. The large teeth are fused into dental plates in a 1-7 series forming a tessellated pattern. The middle row of teeth in the upper jaw are much longer than the other teeth. The skin is smooth on the dorsal and ventral sides of the body however large adults may be somewhat prickly along the midbody region and the base of the tail. Males possess a prominent, conical supraorbital tubercle on each side. The maximum reported size of the common eagle ray is a disc width of 72 inches (183 cm) and the maximum reported weight is 32 pounds (14.5 kg). Male common eagle rays reach sexual maturity at 15.7-19.7 inches (40-50 cm) total length while females mature at 23.6-27.6 inches (60-70 cm) total length. Common eagle rays feed on benthic crustaceans and mollusks by dislodging them from the sediments with their pectoral fins tips and subrostral lobe. They are also known to feed on fishes. They are sometimes considered destructive to commercial oyster and clam beds. 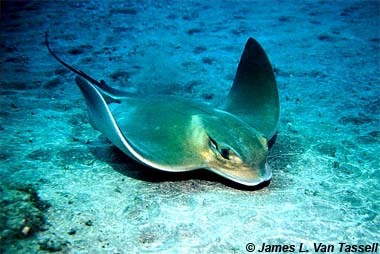 The reproductive mode of the common eagle ray is ovoviviparous. Gestation is approximately 6-8 months in length and 3-7 young are produced. Newly born eagle rays closely resemble the adults in morphology. Potential predators of the common eagle ray include larger fish such as sharks. The monogenean Entobdella diadema has been reported to cause severe skin lesions near the gills and mouth of the common eagle ray. This ray is also documented as a host for the parasitic copepod Lernaeopoda galei. The common eagle ray was originally described as Raja aquila by Linnaeus in 1758. This name was later changed to the currently valid Myliobatis aquila (Linnaeus 1758). Synonyms appearing in past scientific literature referring to the common eagle ray include Myliobatis noctula Bonaparte 1833, Raia rhombus Larrañaga 1923, and Myliobatis cervus Smith 1935.